Hi, ribbon-loving friends! Karen Letchworth here today with a confession.....I LOVE RIBBON - and I love putting it on everything I create. It seems that Pocket Cards have become my "go-to" card lately, and the reason why I love them SO much is because the people who receive them really LOVE them. And for me, it makes it so easy to tuck in a journalling card and gift card, so my gift-giving for that event is completely taken care of. 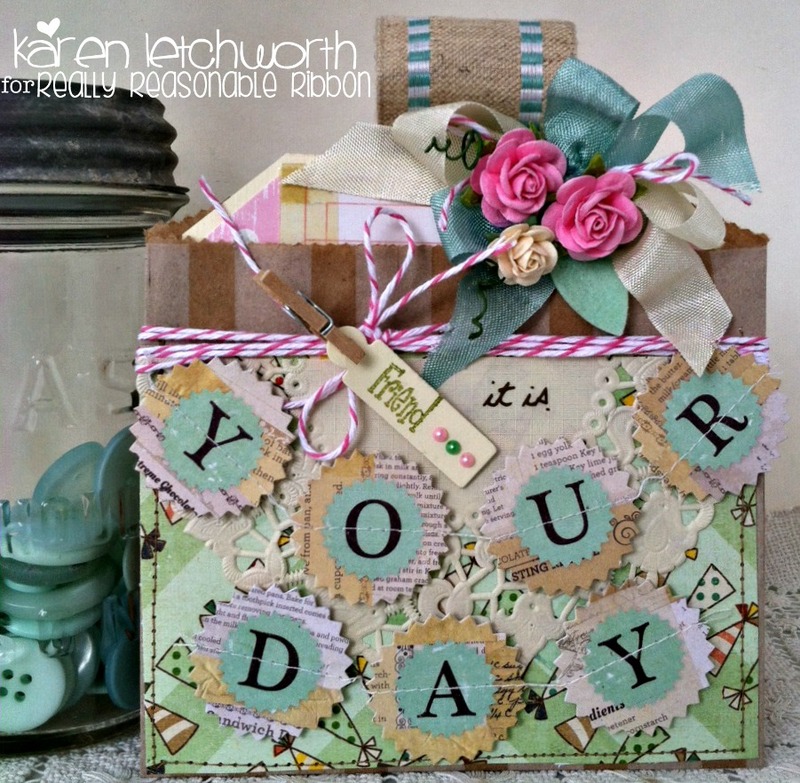 Really Reasonable Ribbon has EVERYTHING you would need to create this sweet Pocket Card. It started with an ADORABLE Middy Biddy Kraft Bag With Vertical Stripes. These darling bags come in several styles (horizontal stripes, vertical stripes, polka dots, etc. ), and they are currently ON CLEARANCE in the Really Reasonable Ribbon store for just $1.65 for a package of 10 (ten) bags. I really encourage you to GRAB SOME before they're all gone! Next, I added some patterned papers and embellishments, a cream doily, and I wrapped several lengths of Raspberry Baker's Twine around the bag and into a bow. Onto that, I clipped a miniature tag that's held with a tiny wooden clothes pin. Inside the bag, I tucked in a decorated journalling tag to which I added a ribbon pull-tab made of Wide Natural Burlap With Wired Edge in Teal. This second photo shows a close-up of my BIG bow. It was made with Cream Seam Binding, yummy Bay Leaf Seam Binding, Raspberry Baker's Twine, and was topped with some of our GORGEOUS Wild Orchid Crafts Mulberry Flowers including Deep Ivory Open Roses and Pink Open Roses to give it a soft, sweet touch. I also tucked in a sea foam green wool felt leaf that I die-cut. How sweet! 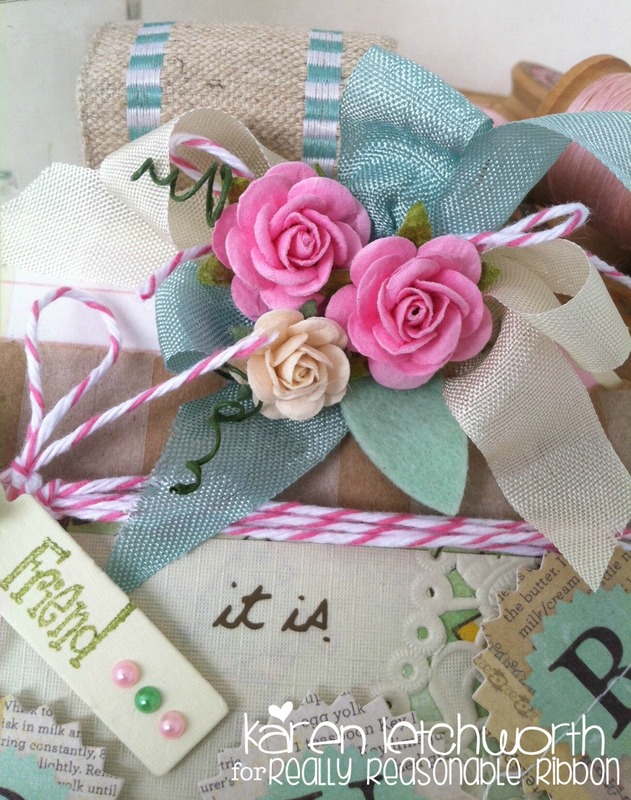 There's really no end to all the GORGEOUS things you can create with Really Reasonable Ribbon's amazing ribbons, laces, trims, flowers, decorative bags, and SO much more. 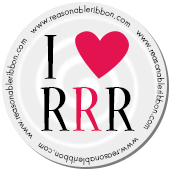 I encourage you to take the time to browse the Really Reasonable Ribbon store today, and to treat yourself to some of the great Clearance items, and some of the amazing ribbons and trims from their awesome selection. You're sure to find something DELIGHTFUL! Have a great day, and thank so much for stopping by - there's some really great inspiration here EVERY DAY. Don't forget to check out our FUN CHALLENGE going on now. We'd LOVE to have you play along with us. You're also welcome to visit my blog, My Cup Runneth Over, to say hello. Happy RIBBON crafting!